I began to cherish these types of cultural experiences and seek them out on my own. I love the feeling and learning that comes with entering into a different culture — whether eating at an authentic Ethiopian restaurant in Alexandria or in the home of a Persian family in Turkey. This is why people travel. And this is why I’m prone to say yes to almost any new experience, especially if it involves food. 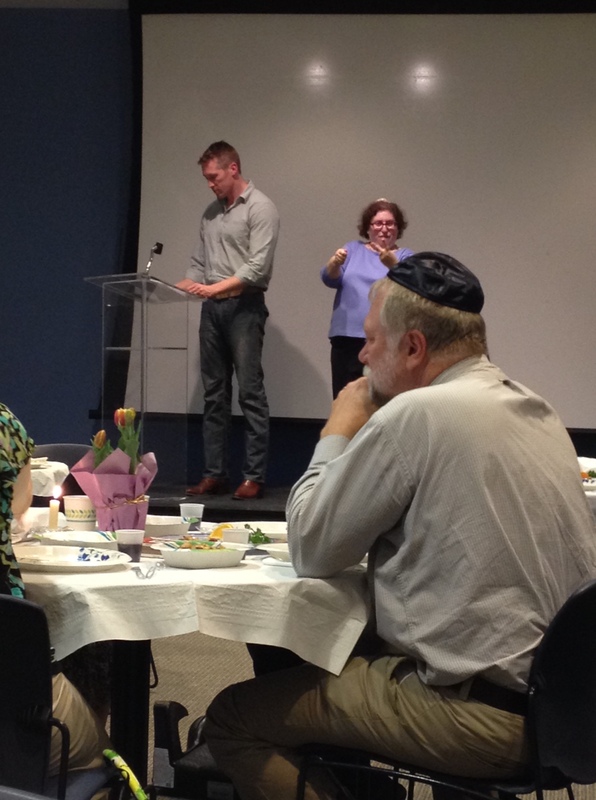 So I was thrilled this week when my friend Rhea invited us to attend a Passover Seder meal at Gallaudet University, where she’s a professor. 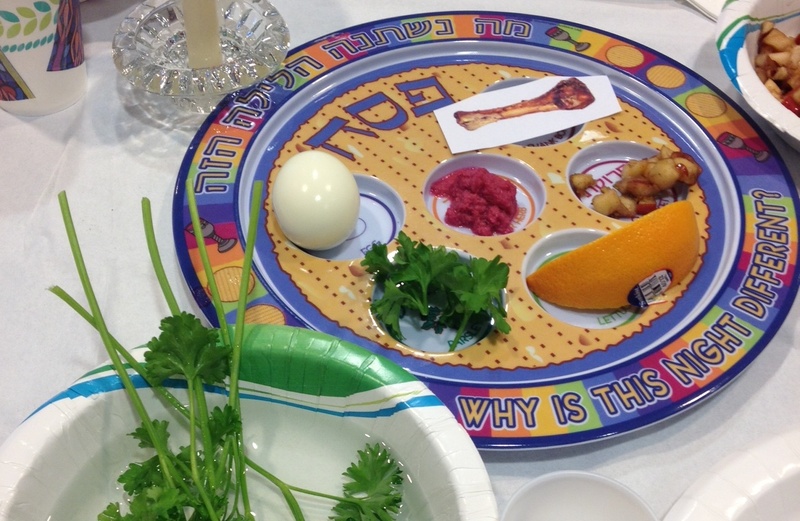 Rhea wrote a piece for the Post Food section last week on going back to the book for a more traditional Passover this year, and it left me intrigued about every facet of the religious holiday. 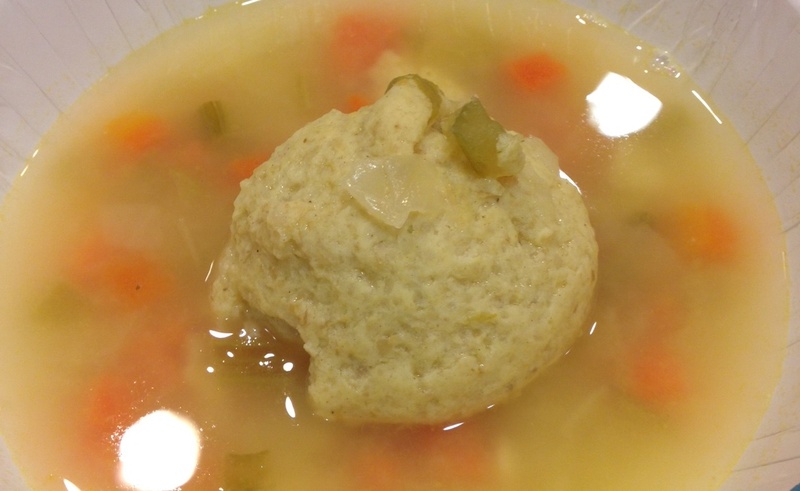 Matzoh (matzah, matzo) ball soup. As a Christian and Bible reader, I loved hearing these stories from the Jewish Torah (and my Old Testament) brought to life in the context of this sacred ceremony. Reading Exodus 12 and 13 myself, I had only imagined what the ceremony among Jews might look like today. I quickly brushed up on my Seder protocol on the way to the event (ahem, reading from this Wikipedia page), but Rhea was a much better guide to the evening’s festivities in person. It helps that she is also fluent in sign language. Gallaudet is a small and tightly-knit university for the deaf and hard of hearing located near D.C.’s newly famed Union Market. The university’s Hillel, an organization for Jewish campus life, hosted the event that drew some 50 people to observe the first day of Passover together. The vast majority of people in the room communicated by signing, which was a cultural experience in itself for us. I find the language so beautiful and am amazed by the skill it takes to think and speak in two languages simultaneously. Cole and I also got called up to participate in reading portions of the Haggadah, the Jewish text that walks participants through the Seder, though thankfully the organizer didn’t make us attempt to sign anything. I loved how Rhea, who grew up celebrating this Passover Seder, would alert us to her “favorite part” coming up in the story as it progressed. Many had the Hebrew blessings memorized and recited them with the speaker, who then translated them with signs and into English phrases. Reading through the Haggadah involves drinking four cups of wine (or grape juice) and eating bits of matzoh bread and other items from the Seder plate, like parsley or the bitter root represented by a mixture of horseradish and beet at this particular event. Cole especially liked the charoset, a mixture of diced apples, spices and wine or juice, that represents the mortar the Jews used to build bricks while in Egyptian captivity. After the readings, which lasted probably an hour, organizers brought in a long buffet of food that would comprise our meal (had I know so much food was coming, I would have laid off the matzoh and juice a bit). 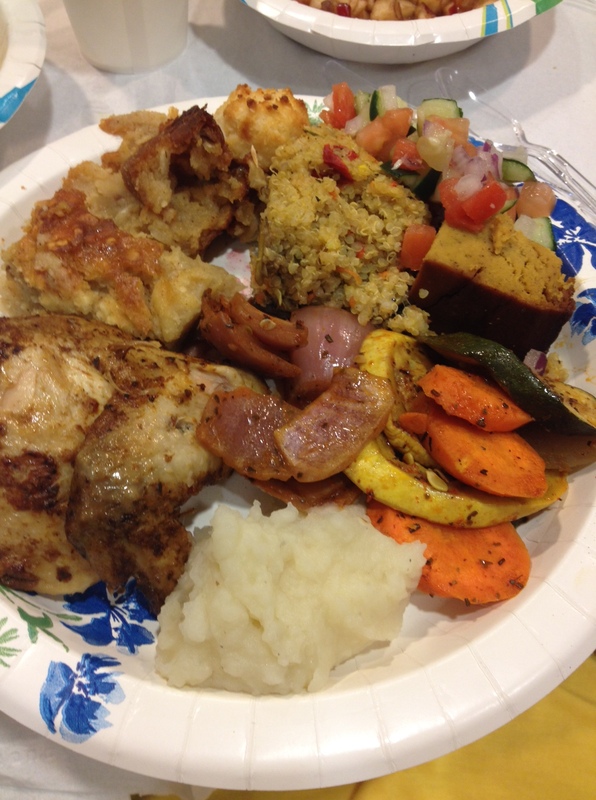 The food at this Seder (not that I have anything to compare it to) was excellent. I love the creativity that the dietary restrictions of Passover breed. Since leavened grains are not permitted during this week in remembrance of the Israelites hurried exodus from Egypt, the mushrooms were stuffed with quinoa, for example. Matzoh was still used in many of the foods, like the apple kugel that was one of our favorite items. It tasted like apple sheet cake, and another version of kugel tasted like a pumpkin bar. Vegetable dishes abounded and roast chicken was available for the meat eaters. The meal also included the traditional matzoh ball soup, pictured above, which is one of the bites I looked forward to most. It seems I read an article in Bon Appetit every year about “how to make your matzoh balls better,” and I had yet to try to stuff. Cole devoured the dumpling-like balls, which are often boiled before being added to the light broth, so it looks like I may need to try my hand at it. The only thing I didn’t take to was the gefilte fish, a mixture of ground white fish that looks like a log of pate and is served cold. I may have liked it better were I not already full of other food, or had I doused it in the delicious horseradish. If including us in the evening weren’t enough, the organizer insisted that we take some leftovers home as well. We’re headed back out of town this weekend, so we didn’t want to take too much. Cole also was the lucky finder of a matzoh (picture) under his seat, which meant we got to take home the centerpiece, a pot of lovely yellow tulips. I’ll have to plant them in my yard and hope they bloom in time for next year’s Passover, as a sweet reminder.